The New Ecology: Rethinking A Science For The Anthropocene. (2016) Oswald J. Schmitz. Princeton University Press. 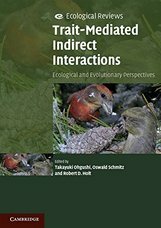 Trait-Mediated Indirect Interactions: Ecological Evolutionary Perspectives. (2012) Edited with Ohgushi, T. and R.D. Holt. Cambridge University Press with the British Ecological Society Ecological Reviews Series. Resolving Ecosystem Complexity. (2010) Monographs in Population Biology Series: Princeton University Press. ​Buchkowski, R.W., O.J. Schmitz and M.A. Bradford. 2019. Nitrogen recycling in coupled green and brown food webs: weak effects of herbivory and detritivory when nitrogen passes through soil. Journal of Ecology 107:963-976. Hammerschlag, N., O.J. Schmitz, A.S. Flecker, K.D. Lafferty, A. Sih, T.B. Atwood, A.J. Gallagher, D.J. Irschick, R. Skubel and S.J. Cooke. 2019. Ecosystem function and services of aquatic predators in the Anthropocene. Trends in Ecology and Evolution 34:369-383. Rosenblatt, A.E., K.S. Wyatt and O. J. Schmitz. 2019. Will like replace like? Linking thermal performance to ecological function across predator and herbivore populations. Ecology 100: e02643. ​Yona, L., B. Cashore and O.J. Schmitz. 2019. Integrating policy and ecology within a single system to achieve path dependent climate solutions. Environmental Science and Policy (in press). Barton, B.T. and O.J. Schmitz. 2018. Opposite effects of daytime and nighttime warming on top-down control of plant diversity. Ecology 99:13-20. Burak, M.K., J.D. Monk and O.J. Schmitz. 2018. Eco-Evolutionary Dynamics: The predator-prey adaptive play and the ecological theater. Yale Journal of Biology and Medicine 91:481-489. Burghardt, K.T., M.A. Bradford and O.J. Schmitz. 2018. Acceleration or deceleration of litter decomposition by herbivory depends on nutrient availability through intraspecific differences in induced plant resistance traits. Journal of Ecology 106:2380-2394. Kofler, N., J.P. Collins, J. Kuzma, E. Marris, K. Esvelt,.M.P. Nelson, A. Newhouse, L.J. Rothschild, V.S. Vigliotti,.M. Semenov, R. Jacobsen, J. E. Dahlman, S. Prince, A. Caccone, T. Brown and O.J. Schmitz. 2018. Editing nature: local roots of global governance. Science 362: 527-529. Moore, A.C. 2018. Context-dependent consumer control in New England tidal wetlands. PLoS ONE 13(5): e0197170. Rosenblatt, A.E. 2018. Shifts in plant nutrient content in combined warming and drought scenarios may alter reproductive fitness across trophic levels. Oikos 127: 1853-1862. Rutenbeck, N.E., B.R. Frey, K.R. Covey, G.P. Berlyn, O.J. Schmitz, B.C. Larson and M.S. Ashton. 2018. Influence of gap position and competition control on the leaf physiology of planted Picea glauca and natural regeneration of Populus tremuloides. Forest Ecology and Management 424:228-235. ​Schmitz, O.J. 2018. Defending biodiversity in the age of humans. Ecology 99:2412-2413. Schmitz, O.J. 2018. Species and ecosystems and all that jazz. PloS Biology 16(7): e2006285. Schmitz, O.J. and A.E. Rosenblatt. 2018. Editorial overview: Global change, evolutionary ecology and adaptation. Current Opinion in Insect Science 29: iii-v.
Schmitz, O.J., C.C. Wilmers, S.J. Leroux, C.E. Doughty, T.B. Atwood, M. Galetti, A.B. Davies, S. J. Goetz. 2018. Animals and the zoogeochemistry of the carbon cycle. Science 362: eaar3213. Smith-Ramesh, L.M., Rosenblatt A.E. and Schmitz, O.J. 2018. Multivariate climate change can favor large herbivore body size in food webs. American Naturalist 191:333-342.
van Eeden, L.M., A. Eklund, J.R.B. Miller, J.V. López-Bao, G. Chapron, M.R. Cejtin, M.S. Crowther, C.R. Dickman, J. Frank, M. Krofel, D.W. Macdonald, J. McManus, T.K. Meyer, A.D. Middleton, T.M. Newsome, W.J. Ripple, E.G. Ritchie, O.J. Schmitz, K.J. Stoner, M. Tourani and A. Treves. 2018. Carnivore conservation needs evidence-based livestock protection. PLoS Biology 16(9): e2005577. Buchkowski, R.W., M.A. Bradford, A.S. Grandy, O.J. Schmitz, and W.R. Wieder. 2017. Applying population and community ecology theory to advance understanding of belowground biogeochemistry. Ecology Letters 20: 231-245. Coblentz, K. E., Rosenblatt, A. E. and Novak, M. 2017. The application of Bayesian hierarchical models to quantify individual diet specialization. Ecology, 98: 1535–1547. Delavaux, C.S, Smith-Ramesh, L.M., and Kuebbing, S.E. 2017. Beyond nutrients: a meta-analysis of the diverse effects of arbuscular mycorrhizal fungi on plants and soils. Ecology 98: 2111–2119. Northfield, T.D., Barton, B.T. and Schmitz, O.J. 2017. A spatial theory for emergent multiple predator-prey interactions in food webs. Ecology and Evolution 7:6935-6948. Rosenblatt, A.E., L.M. Smith-Ramesh, and O.J. Schmitz. 2017. Interactive effects of multiple climate change variables on food web dynamics: modeling the effects of warming, CO2, and water availability on a tri-trophic food web. Food webs 13:98-108. Schmitz, O.J. 2017. Predator and prey functional traits: understanding the adaptive machinery driving predator-prey interactions. F1000 Research (F1000 Faculty Rev)6:1767. Schmitz, O.J. and Rosenblatt, A.E. 2017. The temperature dependence of predation stress and prey nutritional stoichiometry. Frontiers in Ecology and Evolution 5:73. Schmitz, O.J., R.W. Buchkowski, J.R. Smith, M. Telthorst, A.E. Rosenblatt. 2017. Predator community composition is linked to soil carbon retention across a human land use gradient. Ecology 98:1256-1265. Schmitz, O.J., J.R.B. Miller, A.M. Trainor, and B. Abrahms. 2017. Toward a community ecology of landscapes: predicting multiple predator-prey interactions across geographic space. Ecology 98:2281-2292. Smith-Ramesh, L.M. 2017. Invasive plant alters community and ecosystem dynamics by promoting native predators. Ecology 98:751-761. Smith-Ramesh, L.M., A.C. Moore and O.J. Schmitz. 2017. Global synthesis suggests that food web connectance correlates to invasion resistance. Global Change Biology 23: 465-473. Buchkowski, R.W. 2016. Top-down consumptive and trait-mediated control do affect soil food webs: It's time for a new model. Soil Biology and Biochemistry 102: 29-32. Donihue, C.M. 2016. Microgeographic variation in locomotor traits among lizards in a human-built environment. PeerJ 4, e1776. Donihue, C.M. 2016. Aegean wall lizards switch foraging modes, diet, and morphology in a human-built environment. Ecology and Evolution 6: 7433–7442. Ko, C-Y, O.J. Schmitz, and W. Jetz. 2016. The limits of direct community modeling approaches for broad-scale predictions of ecological assemblage structure. Biological Conservation 201: 396-404. Mendelsohn, R, I.C. Prentice, O.J. Schmitz, B. Stocker, R.W. Buchkowski, and B. Dawson. 2016. The ecosystem impacts of severe warming. American Economic Review: Papers and Proceedings. 106: 612-614. Rosenblatt, A.E., Crowley, B.T., and Schmitz, O.J. 2016. Linking trophic interactions to plasticity in thermal sensitivity of geographically separated populations of a herbivore. Evolutionary Ecology 30:649-661. Schmitz, O.J. and G.C. Trussell. 2016. Multiple stressors, state-dependence and predation risk – foraging trade-offs: toward a modern concept of trait-mediated indirect effects in communities and ecosystems. Current Opinion in Behavioral Sciences 12: 6-11. Burghardt, K.T. and O.J. Schmitz. 2015. Influence of plant defenses and nutrients on trophic control of ecosystems. Ch. 8 In T. Hanley and K. LaPierre (Eds.) Trophic Ecology: Bottom-Up and Top-Down Interactions across Aquatic and Terrestrial Systems, Cambridge University Press. Donihue, C.M., K.M. Brock, J. Foufopoulos, A. Herrel. 2015. Feed or fight: What drives bite force differences in the Aegean Wall Lizard, Podarcis erhardii, across the Greek Cyclades? Functional Ecology 30: 556-575. Fraser, L.H., W.L. Harrower, H.W. Garris, S. Davidson, P.D.N. Hebert, R. Howie, A. Moody, D. Polster, O.J. Schmitz, A.R.E. Sinclair, B.M. Starzomski, T. P. Sullivan, R. Turkington, and D. Wilson. 2015. A call for applying trophic structure to restoration. Restoration Ecology 23:503-507. Schmitz, O.J., R.W. Buchkowski, K.T. Burghardt, and C.M. Donihue. 2015. Functional traits and trait-mediated interactions: connecting community-level interactions with ecosystem functioning. Advances in Ecological Research 52:319-344. Smith, LM, and O.J. Schmitz. 2015. Invasive plants may promote predator-mediated feedback that inhibits further invasion. Ecology and Evolution 5:2411-2419. Donihue, C.M., and M.R. Lambert. 2014 Adaptive evolution in urban ecosystems. AMBIO 44:194-203. Glick, H.B. 2014. Modeling cougar habitat in the Northeastern United States. Ecological Modeling 285: 78-89. Ko, C-Y., O.J. Schmitz, M. Barbett-Massin, and W. Jetz. 2014. Dietary guild composition and disaggregation of avian assemblages under climate change. Global Change Biology 20: 790-802. Miller, J.R.B., J.M. Ament, and O.J. Schmitz. 2014. Fear on the move: predator hunting mode predicts variation in prey mortality and plasticity in prey spatial response. Journal of Animal Ecology 83(1): 214-222. Ripple, W.J., J.A. Estes, R.L. Beschta, C.C. Wilmers, E.G. Ritchie, M. Hebblewhite, J. Berger, B. Elmhagen, M. Letnic, M. P. Nelson, O.J. Schmitz, D.W. Smith, A.D. Wallach and A. J. Wirsing. 2014. Status and ecological effects of the world's largest carnivores. Science 243(6167): 1241484. Rosenblatt, A.E., and O.J. Schmitz. 2014. Interactive effects of multiple climate change variables on trophic interactions: a meta-analysis. Climate Change Responses 1:8. Schmitz, O.J. and B.T. Barton. 2014. Climate change effects on behavioral and physiological ecology of predator-prey interactions: implications for conservation biological control. Biological Control 75: 87-96. Schmitz, O.J., P.A. Raymond, J. A. Estes, W.A. Kurz, G.W. Holtgrieve, M.E. Ritchie, D.E. Schindler, A.C. Spivak, R.W. Wilson, M.A. Bradford, V. Christensen, L. Deegan, V. Smetacek, M.J. Vanni, and C.C. Wilmers. 2014. Animating the carbon cycle. Ecosystems 7:344-359. Sergio, F., O.J. Schmitz, C.J. Krebs, R.D. Holt, M.R. Heithaus, A.J. Wirsing, W.J. Ripple, E. Ritchie, D. Ainley, D. Oro, Y. Jhala, F. Hiraldo and E. Korpimäki. 2014. Towards a cohesive, holistic view of top predation: a definition, synthesis and perspective. Oikos 123: 1234-12143. Trainor, A.E. and O.J. Schmitz. 2014. Infusing trophic dependencies into analyses of geographic distributions of species. Ecology Letters 12: 1507-1517. ​Trainor, A.E., O.J. Schmitz, J. Ivan, and T.M. Shenk. 2014. Enhancing species distribution modeling by characterizing predator-prey interactions. Ecological Applications. 24:204-216. Balog, A. and O.J. Schmitz. 2013. Predation determines different selective pressure on pea aphid host races in a complex agricultural mosaic. PLoS ONE 8(2): e55900. Balog, A. and O.J. Schmitz. 2013. Predation drives stable coexistence ratios between red and green pea aphid morphs. Journal of Evolutionary Biology 26: 545-552. Barrett, K. J. and O. J. Schmitz. 2013. Effects of deer settling stimulus and deer density on regeneration in a harvested southern New England forest. International Journal of Forestry Research: Article ID 690213. Schmitz, O.J. 2013. Global climate change and the evolutionary ecology of ecosystem functioning. Annals of the New York Academy of Science 1297: 61-72. Schmitz, O.J. 2013. Terrestrial food webs and vulnerability of the structure and functioning of ecosystems to climate. In R. Pielke Sr., T. Seastedt and K. Suding (Eds). Climate Vulnerability, Elsevier Publishing. Schmitz, O.J., M. A. Bradford, M.S. Strickland and D. Hawlena. 2013. Linking predation risk, herbivore physiological stress and microbial decomposition of plant litter. Journal of Visualized Experiments 73: e50061. Strickland, M.S., D. Hawlena, A. Reese, M.A. Bradford and O.J. Schmitz. 2013. Trophic cascade alters ecosystem carbon exchange. Proceedings of the National Academy of Science USA 110:11035-11038.